“Alan Charlton is an artist who makes a gray painting”—so goes the artist’s self-stated epigram. 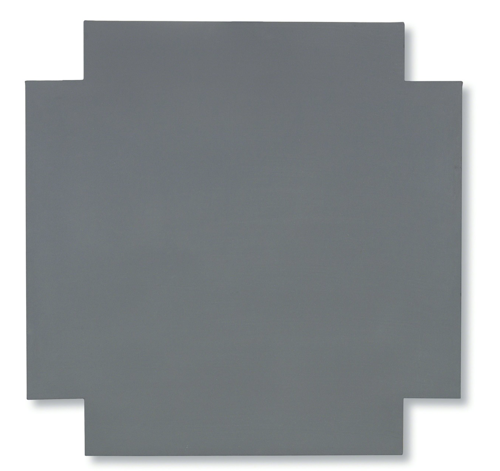 In the 1970s, Charlton famously decided to make monochromatic paintings using only shades of gray and canvases whose dimensions are factors of 4.5 cm. He settled on gray because he considered it the epitome of ordinary, but quickly realized the color’s permutable potential and expressiveness. Though he works within these strict parameters, Charlton has explored a wide variety of formal possibilities and combinations using his limited materials. He tends to work serially and methodically through iterations of an idea. “I want my paintings to be: abstract, direct, urban, basic, modest, pure, simple, silent, honest, absolute,” Charlton says of his work.